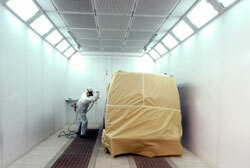 For heavy duty automotive painting or industrial coating and finishing jobs, a spray booth is a necessity. Providing everything you need to integrate compressed air with specified covering for the ease, cleanliness, and precision of application, this structure makes difficult coating and painting projects painless. Spray booths are designed to filter dirt and other contaminates out of the room to ensure the professional look and quality of the job. They collect paint or coating particles in the air as well to keep the product’s finish unspoiled and the air inside safe. These features prevent your projects from being tainted and substandard, saving you costs in touchups and damage repair. Spray booths come in many shapes and sizes for completing a wide variety of jobs. Since 1982, A & W Compressor has been providing expert consultation, sales, and installation to companies across Tennessee. Whether you paint cars in Bristol or powder coat products in Knoxville, we can fit you with an automotive or industrial spray booth to suit your industry and your budget. Call or e-mail us today to discuss the right spray booth for your business.